In the current labor market, chances are you’re experiencing difficulty finding qualified skilled tradespeople to fill your positions. And you’re not alone. According to Manpower’s Hardest Jobs to Fill survey, employers in six of the world’s ten largest economies ranked skilled trades as the top one or two hiring challenge. This stems from several issues, including increasing retirement of blue-collar workers without adequate replacements, technical training that is not keeping up with businesses’ needs, and the next generation of workers’ lack of interest in skilled trades professions. Despite these challenges, there are great opportunities on the horizon as numerous industries project job growth within skilled trades occupations, indicating a stronger economy fueling more business activity. 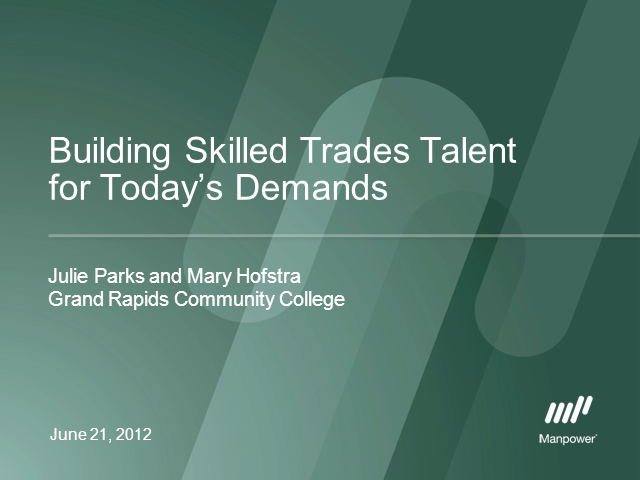 The critical question: How can businesses ensure they have the qualified skilled trades talent necessary to keep up with increasing demand and take advantage of new opportunity?